An integral part of child development is learning language. It is a three-pronged process requiring the capacity to perceive, produce, and use words to understand and communicate. Learning language is conscious and implicit, and it starts from the moment your child is born. That’s why a conducive learning environment is key for your little one to develop language abilities to their optimum. • Teach nursery rhymes. Research shows this paves the way for reading skills that are best for 3-year olds. • Teach your child to raise his mind and heart to God with simple and spontaneous prayers. • Ask open ended questions to help him think clearly. • Talk as you play together. • Listen to your child. • Encourage him to do word games such as scrabble and crossword puzzles. • Use online language learning games and tools. • Limit screen time while encouraging reading time. • Encourage him to write letters. • Provide writing tools – pens, paper, dictionary, thesaurus, etc…. Parents delight in their child's many firsts. But expectations are continuous for language learning. We expect our children to expand their vocabulary, sharpen comprehension skills, improve their writing skills, and in the process, express themselves clearly. A child's basic language skills can advance very quickly. 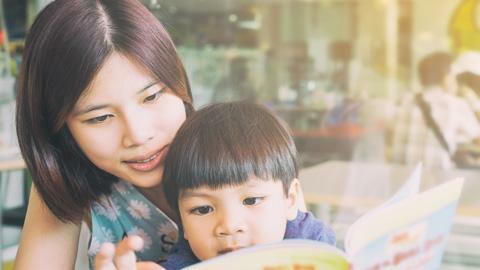 Healthcare professionals should reassure parents that in children's formative years, sufficient exposure to another language is a requisite that will enable them to speak two languages deftly as a first language speaker. There is a window of language learning up to age 12. It is amazing how children can learn so quickly and naturally by language acquisition! By comparison, a person past this critical period has to acquire language learning actively through explicit instruction and education. Parents and healthcare professionals should collaborate when children show signs of learning at a slower pace than expected. Children learn when they are ready. Often, they might be focused on other things, or are learning in a different way. It is best not to show disappointment or distress, which can make them feel pressured. Children learn to strive for success early on in school. They bask in the admiration of parents, teachers, and classmates when they perform well, helping develop their self-esteem and social competence. So much hinges on their academic performance that those who cannot cope because of learning disabilities suffer failure in school, and are affected emotionally and socially. The two most common reasons for a child's poor academic performance are Learning Disorders (LD) and Attention Deficit Hyperactivity Disorder (ADHD). A child with learning disabilities is not necessarily dense. Often, affected children are of average or high intelligence. They have difficulty learning the usual way due to faulty wiring in the cortex region of the brain. A child will have a problem depending on the affected part. These may vary from dyslexia (reading disorder), dysphasia or aphasia (writing disorder), nonverbal learning disability (poor visual/spatial skills, problematic social relationships, and poor organizational skills), dysproxia (motor skills, disorders of speaking and listening), to auditory processing disorder (difficulty comprehending more than one task at a time). Healthcare professionals should be more discerning and sensitive. They should not attribute poor learning to laziness, assuring parents the child will snap out of the phase. With LD, they do not. Waiting it out does not work either. Healthcare professionals should be able to ask leading questions for them to identify and manage such conditions. Beyond diagnostic skills, they should be able to furnish parents with sources of information and support including special education teachers, mental health professionals who can provide the suitable combination of medical, nutritional, psychosocial, and educational treatments. LDs cannot be cured nor fixed, but with the right support and intervention, a disabled learner can be taught to cope and succeed. The environment plays a key role in a child's ability to learn language. His experiences at home, school, and the community will determine the extent of learning. Parents, teachers, and counsellors should take the cue and cultivate a love for language, which forms the basis for learning in all content areas. Being around for the child, providing him with love and encouragement, building a language enhanced environment will go a long way in honing his skills. Going a step further, enrolling a child in the right language center is a step in the right direction. In today's age of information, it pays to develop a child's skills as a cohesive whole.